E.L. Harvey & Sons has faced a space crunch at its site in Westborough, forcing it to pay for the removal of refuse it was once able to sell. Buried in the mountains of refuse at Casella’s recycling plant in Charlestown are tons of material that should have gone straight to the landfill — from tires and pots to lobster buoys and garden hoses — items that can gum up the machines and taint the byproducts ultimately sold as commodities. The increasing amount of such non-recyclable waste entering processing plants has sparked a backlash in the countries that convert the material into useful products, most notably China, which used to process the vast majority of US recyclables before it cracked down on what materials it would accept this year. 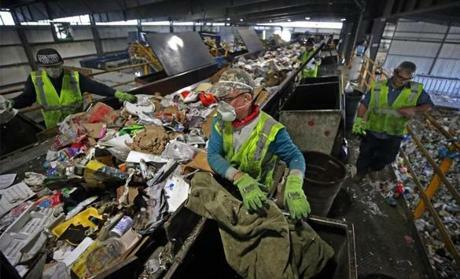 The result is a backup at some recycling plants in Massachusetts and across the United States, driving up costs and disrupting the industry and local municipalities’ refuse efforts. Towns that used to earn money from recycled waste are now forced to pay as much as $70 a ton to have it hauled to landfills or incinerators. The problems began last summer, when Chinese officials announced as part of a major antipollution campaign that they would no longer import 24 materials, including mixed paper and a range of plastics. The Chinese also vowed to accept far less cardboard and scrap metal, limiting the items to those with impurities of just 0.5 percent. They previously took material that was far more tainted by food scraps and other non-recyclables. Since the new policy went into effect on Jan. 1, US exports of recyclable material to China have plunged. Facilities such as the one in Charlestown have slowed their sorting process to reduce the amount of impurities in the bales of material they ship abroad, but plant owners say their equipment can’t reach such levels of purity. 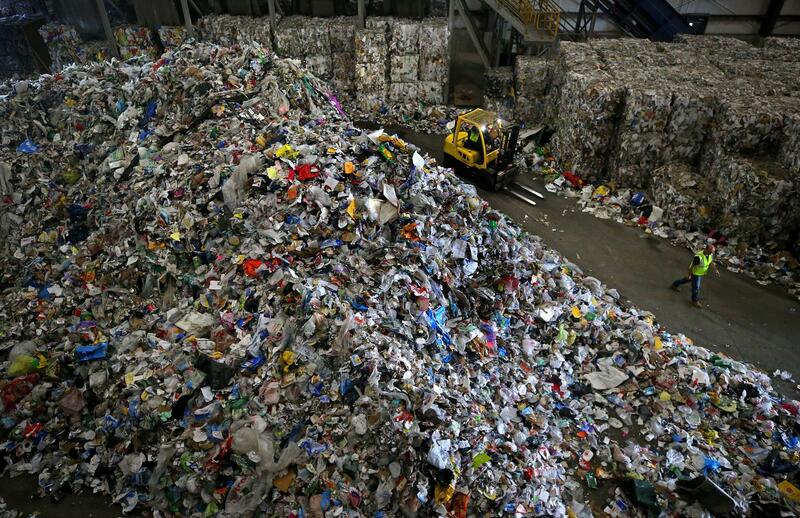 At E.L. Harvey & Sons, a recycling company in Westborough, the plant’s parking lot has been overtaken by about 5,000 tons of paper and cardboard that it hasn’t been able to discard. Usually, the company would have a few hundred tons stockpiled until it received a decent price for the material. Now, with 400 tons of new material coming in every day — only about half of which they can recycle — the company has been paying to send as much of the refuse away as possible, taking a significant loss. Many of them are already feeling it. In Rockland, for example, residents were paying $3 a ton to have their recyclables collected and hauled away; now they’re paying $70. Abington is now paying $62 a ton, up from zero. In Plymouth, the costs spiked so much that town officials last week eliminated its curbside recycling program. The problem, she and others said, is that US sorting facilities have been sending too many bales of tainted material abroad, particularly to China, India, and Vietnam. With the rise of single-stream recycling, many residents have become less conscientious about what they deposit in recycling bins, with everything from bowling balls to Christmas lights fouling up the machines at sorting plants, she said. In Braintree, where the cost of recycling has risen from about $4 a ton last year to $47, local officials are worried about what will happen in the coming months. If the costs continue to rise, she worries the town may have to cut other services, such as education or transportation projects. “The runaway escalation isn’t sustainable,” she said. Boston officials didn’t respond to questions about the impact of China’s new policies on the city. Workers attempted to dig trash from recyclables at E.L. Harvey & Sons. Many nations have cracked down on receiving tainted recyclables. Some local officials and recycling companies have been urging the state to take action to help defray the costs. State officials declined to answer questions, but in a statement said they are seeking to mitigate local costs with a variety of programs and efforts. For example, they said, they are working with municipalities to create a common list of acceptable recyclables for residents and have been encouraging new glass recycling businesses to move to Massachusetts, since glass constitutes about 20 percent of the state’s recycling stream. The state Department of Environmental Protection “will continue to work with neighboring states and companies to ensure responsible recycling continues,” said Ed Coletta, a spokesman for the agency. The crisis has also sparked tensions between municipalities and the companies that collect their recycling. Last month, New Bedford filed a lawsuit against ABC Disposal Service, after the New Bedford-based company threatened to stop collecting recyclables there, as well as in Fairhaven, Mattapoisett, Rochester, and Plymouth. The company had increased rates in response to the rising costs. In a letter to the company, local officials acknowledged that ABC Disposal’s costs had risen as a result of China’s new policies but asked to review the company’s financial records before agreeing to modify their contacts to allow higher rates. “ABC’s mere assertions that it needs contract increases in order to survive are an insufficient basis on which to impose an additional burden on taxpayers,” they wrote. After the company refused, New Bedford filed the lawsuit, claiming the company was breaching its contracts. “The company’s repeated refusals to share its financial information with the city, as well as its recent conflicting statements about whether it will comply with its contract, have left the city no choice but to seek a court order that will protect taxpayers,” New Bedford Mayor Jon Mitchell said in a statement. Michael Camara, the company’s chief executive, said his costs have surged and he has no choice but to pass them on to customers. ABC Disposal used to earn as much as $45 a ton for the recyclables his employees collected; now the company is paying $100 a ton, he said. Moreover, his company now has to deliver the material to plants as far away as Stamford, Conn., costing it far more in gas and time. He also lamented the environmental consequences, noting that the recyclables are taking up precious space in landfills in Massachusetts.